“Whatever life holds in store for me, I will never forget these words: With great power comes great responsibility. This is my gift, my curse. Who am I? I'm Spiderman.” Actor Tobey Maguire spoke these words in the final scene of Columbia Pictures 2002 movie blockbuster Spiderman. The character must have been reading a lot of stuff by French philosopher Jean-Paul Sartre when he imparted that little nugget of wisdom. Nearly 40 years since his death, Sartre’s philosophical ideas still resonate within modern society and pop culture. He was one of the greatest philosophical thinkers and most versatile writers of his time and alongside his longtime companion Simone de Beauvoir was one of the leading figures in the French intellectual community of the 20th century. Sartre was a principal proponent of Existentialism, a philosophical theory that stresses the individual's unique position as a self-determining agent responsible for the authenticity of his or her choices. Expanding on the 19th century writings of Kierkegaard and Nietzsche, Sartre determined that if man is the maker of his own morality, then his greatest power is the freedom of choice. In the 1940s and 1950s, Sartre through scholarly and fictional works promoted and brought to the mainstream public these existential themes. A complex and captivating figure, Sartre intricately binds together his life, writings, and revolutionary thoughts. 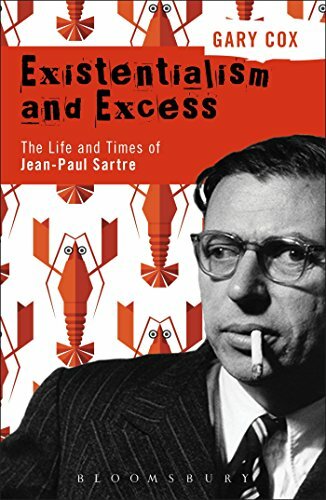 Gary Cox, a Sartre specialist and author of Deep Thought, How to Be an Existentialist, The Sartre Dictionary, and Sartre: A Guide for the Perplexed once again tackles Sartre in Existentialism and Excess: The Life and Times of Jean-Paul Sartre. This easy to read and thought provoking biography explores all of the key events of the legendary philosopher’s life and skillfully examines the close connections between his radical thoughts and philosophical works. The author reconstructs the existentialist crises that helped shape Sartre’s life and concisely capsulizes his complex philosophical concepts so that they are easy to read and understand. Throughout Existentialism and Excess, Cox perceptively identifies the major entanglements, love triangles, friendships, and affairs that engulfed Sartre over his lifetime. In an engaging and accessible manner, the author is able to convey these fascinating interactions into simple literary and biographical context. But Jean-Paul Sartre did create a legacy that is memorable and does not matter simply because he was a great writer, although his exceptional command of styles and genres expertly complemented his purpose. Sartre matters because so many fundamental points of his analysis of the human reality are right and true, and because their accuracy and veracity entail real consequences for our lives as individuals and in social groups. Gary Cox’s Existentialism and Excess is a remarkably vivid and intimate biography that shows the existentialist legend had feet of clay, without in any way diminishing his contributions and greatness. If you are a fan of Jean-Paul Sartre, French intellectual life, philosophy, or biography, in particular, this first-rate account is highly recommended as a starting point for any study of this great man.